As I read what you are about to read, I was struck by my own shortcomings in the area of coffee consumption. My habits were those of the flesh, not of the spirit. Rather than viewing coffee as something to be pursued (like holiness), I had allowed it mere incidental importance in my life. My ecumenical spirit toward all things claiming the name of java had devolved into straight-up liberalism, of the kind Machen himself warned against in 1923. Lost on me was the necessity of a grinder, the superiority of fresh beans over pre-ground. Contra Tertullian, I thought Folgers® and Jerusalem might get along just fine together. I even let my coffee cup be washed: indeed, my own hands took part in this execrable activity. What Joshua and Danielle have done here is issue a clarion call to those of us who have allowed apathy to overtake our Christian thinking in this area. In an age when American churches have largely settled for a decaffeinated gospel, we must unapologetically confess that there are truths worth defending; compromises worth shunning; and hard lines worth drawing (in a spirit of charity, it is true, but drawn they must be). That said, do not be misled into thinking this is a fire-and-brimstone sort of book. Hand in hand with the call to good ethics is an invitation to remember—or perhaps discover for the first time—what a delight coffee, rightly brewed and considered, actually is. 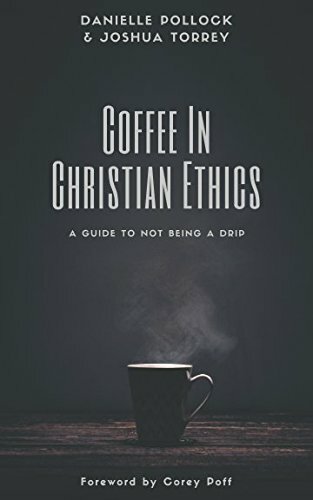 Available now, Coffee in Christian Ethics makes for the perfect morning coffee (and bathroom) reading material.